Spring is here! For many of use, this is the season we completely clean our homes of dust and cobwebs, de-clutter, and let a breath of fresh spring air into our lives. But what about freshening up your smile? There are things you can do at home, on your own, and things you can do with A Plus Dental to ensure that you ‘spring’ into the season with a healthy, stunning smile. Replace your toothbrush. A Plus Dental recommends you replace your toothbrush (or brush head, if you use an electric toothbrush) every three to four months. Brushes should be replaced even sooner if they are frayed or you have been ill.
Store toothbrushes standing up so they can air-dry faster after use. Rinse your brush with tap water after use. Children’s toothbrushes may need to be replaced more frequently. Upgrade your toothbrush? You wouldn’t use a carpet sweeper if you had a vacuum, right? You clean with the most powerful tool available, and the electric toothbrush is that tool for your mouth. Electric toothbrushes eliminate debris more effectively and with less effort on your part. They are extremely useful for people who have poor toothbrushing technique or issues with their hands, such as arthritis, that make brushing difficult. Besides, these brushes come will cool features like built-in timers, to ensure you brush every part of your mouth for enough time! Avoid sugary spring drinks. Sugary drinks can do incredible damage to your teeth. Sugar quickly attaches to the surfaces of your mouth, creating an ideal environment for bacteria. When bacteria consume sugar, it creates enamel-damaging acid, increasing your risk of developing cavities. Restock on supplies. Take inventory and restock your cleaning supplies this spring, including the supplies that clean your teeth. Items such as mouthwash, floss, and toothbrushes are great to have on hand for travelling or house-guests. Consider purchasing extra floss or a toothbrush to leave in your purse or vehicle in case of emergencies. Clean everything. The bathroom is not always the cleanest place in the house, and this can take a toll on the cleanliness of your dental tools. Be sure to keep your toothbrush away from the toilet and don’t use toothbrush covers, which can create a moist environment that is conducive to bacteria growth. Be sure to clean your carrying cases as well. If you use dentures, Invisalign, retainers, or any other dental appliance, give your carrying cases a good hot soak and scrub. Your mouth and teeth will thank you! The simple checkup. A checkup is a crucial part of a dental spring-cleaning. In a regular dental check-up, your A Plus Dental dentist will assess the status of your oral health. We check for any signs of possible dental problems in your mouth, neck, and jaw. Your dentist may also discuss your diet and recommend oral-healthy foods. Oral hygiene instructions may also be given. The result of the assessment will determine whether or not you need other dental treatments. A dental plan may be drafted based on your oral health needs. Scale and clean. Scaling cleans teeth by removing food particles (which are present in the teeth as well as the gums), tartar, and visible stains that are difficult to remove while brushing. Scaling is a routine procedure, and it does not affect one’s teeth, in fact, it cleans teeth and maintains dental hygiene. It can also visibly improve the look of your smile by removing that unsightly tartar! Whitening. During spring cleaning you might paint your fence or wash your windows to make the outside of your house more attractive. Tooth-whitening is a version of that for your smile! At A Plus Dental, we offer Zoom WhiteSpeed teeth whitening – a quick and easy way to achieve a whiter, brighter smile in as little as one hour. 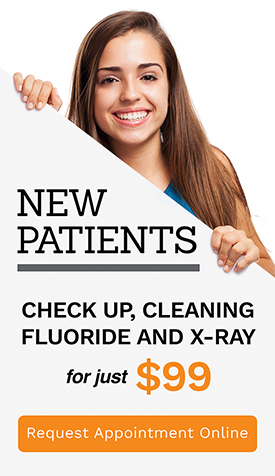 $99 New patient deal which includes Dental Check up, Cleaning, Fluoride treatment and two dental X-rays.